Aranmula Valla Sadhya 2014 details are given here. Aranmula Valla Sadhya vazhipadu, the important offering to the presiding deity at the Sree Parthasarathy Temple at Aranmula will begin from 30th July. The crew of various snake boats would take part in the Vallasadya on the first day on 30th July. Nearly one lakh people are expected to partake of Ashtami-Rohini Vallasadya. Read more to know about Aranmula Vall Sadya 2014. Valla Sadya is one of the biggest celebration which is being conducted in the temple at Aranmula. Aranmula Valla Sadhya vazhipadu, the important offering to the presiding deity at the Sree Parthasarathy Temple at Aranmula begins from 30th July 2014. As per belief, during Valla Sadhya, Lord Krishna, the main deity worshipped in the temple will come to take the offerings from people. The legend says that, in a Valla Sadya all dishes asked for must be given to the people in order to please the lord. This unique mass feast with strong devotional moorings is being given to the crew of Palliyodams (snake boats). During the festival, a snake boat race will be conducted at the Pampa River. Having historical importance, the Vallasadya conducted on Ashtami-Rohini or Sree Krishna Janmashtami day (birth day of Lord krishna) is considered much special. This year 51 palliyodams will take part in the feast. Food is offered to around 1.5 to 2 lakhs people at the Ootupura (a large dining hall) and also the temple yard. As per tradition around 3,500 litres of curd specially prepared will be brought from Chenappady in Kottayam district. According to the practice, on the valla sadya day, the oarsmen will come to the temple in the boat through the river. They offer Nirapara to the presiding deity at the Nadappanthal in front of the golden temple mast and will go round the temple singing Krishna bhajans (Vanchi pattu). The rhythmic vanchi pattu in praise of Lord ParthaSarathy will make the atmosphere more sacred. Immediately after the utcha pooja at the temple, the 'vallasadya' begins. 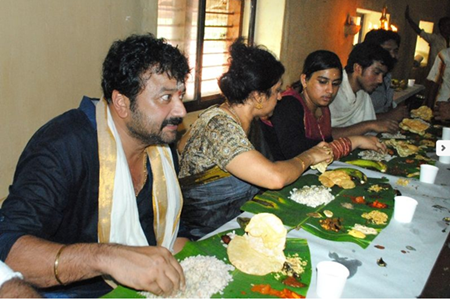 Rice along with 45 varieties of dishes is being served at the Sadya on banana leaves. The following are the items which are gives during the Astamirohini Valla Sadhya. Adaprathaman. (Pudding); Aravana payasam. (Pudding made from rice, jaggery and ghee); Aval (flattened rice); Avial (Mixed vegetable curry); Banana chips; Chammanthi powder (Chutney with chillies); Chukku vellum (dried ginger water); Curd; Ellunda (gingelly ball); Fried banana; Ghee; Ginger curry; Holy water from river Pampa; Kaalhen (curry made from curds); Kaalipazham payasam (Pudding made of banana); Kalkandum (Sugar candy); Kadala Prathaman (made of Bengal gram) ; Kychadi (Curry made of rice and gram); Mango curry; Munthiri pachadi (Curry made of grapes); Olen, (mixed curry); Pacchadi (A vegetable curry); Paal payasm (Pudding made of Milk); Pachamoru; Pulisserry (Curry prepared with thick and sour buttermilk); Resam; Red Cheera Thoran (made with a variety of amaranthus); Sambar; Thakara Thoran (Thoran with cassia tora); Unniappam. It will be a good experience for the devotees as the traditional valla sadya is being followed with great spirit and vigour. The innocence and the sociability shown by the people cannot be explained, but can be truly experienced.